When I think back to the Xbox 360/PlayStation 3 era of video games, one series that stands out is Metro, the post-apocalyptic survival game built with a distinctly Russian flavor (that’s because it was based on a series of novels written by Dmitry Glukhovsky). After a nuclear war decimates Moscow in 2013, the remaining survivors have resorted to living underground, building makeshift shelters and cities in old train tunnels. People started organizing into different factions and even independent states based on their own ideologies and social structure, leaving the old metro rails as the most feasible means of travel between them. Playing as a young man named Artyom, you are sent out to investigate an attack on one of the underground communities by a race of mutated creatures colloquially known as the Dark Ones, a mission that sets him up against fascist underground regimes and a chance to commune directly with the Dark Ones. Even though Metro 2033 and it’s sequel Metro: Last Light had some jank and super-deliberate game mechanics (like using bullets as currency), they were still fun games to play and cool worlds to explore. So, when 4A Games announces a new Metro adventure, I listen. 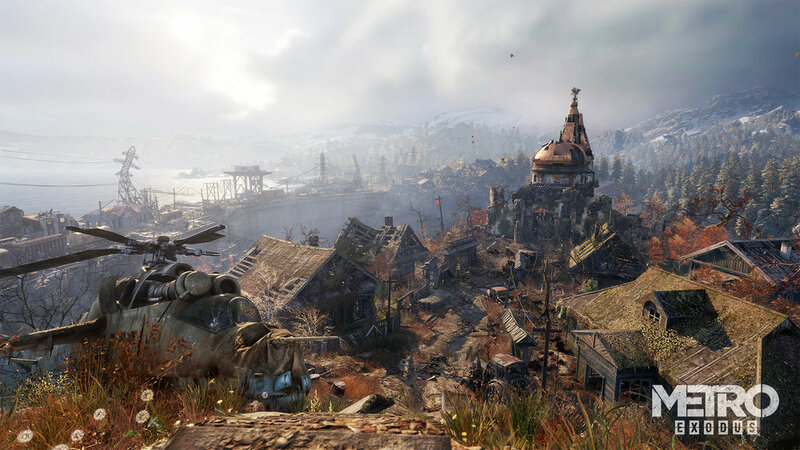 Unveiled at the Xbox E3 conference last year, Metro: Exodus is poised to turn the series on its head by introducing a new open-world format that allows Artyom and company to explore a lot more of the surface world than before. That sounds like a cool concept, given how treacherous Moscow was in previous games. While I’d like to see a more urban Metro game, I would hope the city is as dangerous as it was in previous games. Unfortunately, the beta version I got to play left me a little cold. The biggest concern, I think, was that fifty minutes was not nearly enough time to play a game of this type, considering all the time that gets wasted trying to acclimate to controls, sit through long load screens, and run into a lot of bugs. Grateful as I was to have a personal close look, I left the meeting feeling like they showed the game too early. The demo began with Artyom and his comrades aboard a train car that functions as both a vehicle and a mobile command center. Forced to stop after hitting a roadblock along the tracks, I was tasked with investigating a nearby church the bells of which started ringing after breaking through the makeshift blockade. Piloting a small rowboat, I made my way to the church and was greeted by seemingly kind and welcoming folk who ushered me through a tunnel leading inside the decrepit building. All the while a small child cried out for my attention, trying to flag me down and follow her. Reaching the center of the chapel, I watched as a preacher spouted a sermon on the evils of technology, believing it to be a sin and, from what I could infer from his ravings, the cause for Moscow’s ruin (he’s not wrong, I suppose). I found the little girl from earlier with her mother as she nervously revealed the truth about the church, that its members are filled with religious fervor and called upon to go after newcomers. Alarm bells and shouting broke out. It was time to fight. Combat in Metro: Exodus allows you to either confront enemies head-on or pick them off one at a time by sneaking up behind for a lethal or non-lethal attack. I wasn’t feeling particularly violent that day so I decided to knock out the soldiers quietly to not draw attention. After my third takedown, an extraordinary thing happened. I heard one of the soldiers call out to his compatriots and order them to drop their guns, believing themselves to be no match for me. As a video gamer, this made me feel awesome. Bow before me, peons! Making my way back out of the church, I walked passed soldiers who had dropped their guns and knelt on the ground with their hands above their head, muttering prayers for me not to kill them. So, the decision to kill or not kill these people does have some impact on the game. When I returned to the train, several NPCs heaped praises on me for not killing everyone. I was then given but a moment to reflect on my deed before being ushered off to the next mission. As I struggled to find a way across the river to reach my next objective, I was alerted by 4A Games staff that the session time was over. I wanted the Metro: Exodus demo to wow me, to get me pumped to play the full game when it comes out next year. Instead, I walked away feeling confused and unsatisfied. A lot of the bugs and quirks really soured me on the experience, issues that occurred with a high rate of frequency. My copy of the demo acted strangely from the start. After getting off the train, Artyom seemed to move really slowly even with the sprint button held down. I also couldn’t get any UI prompts to appear, such as the rowboat that I needed to use to advance the mission. I loaded the last checkpoint (which we were specifically told to do if we had to restart) to see if this would fix the problem but I had to sit through an incredibly long load screen. One thing I learned quickly was that Artyom cannot swim, so falling in water results in instant death (why have a cutscene where he swims out of the way of a mutated sea monster, then?) and another lengthy load. Even though the development team was more than forthcoming about this being a beta, I still feel like the game has some bad jank it needs to work through before releasing next year. Most upsetting at all about my time with Metro: Exodus was that I really wasn’t feeling the open world mechanics. Granted, this was just a small part of a game (who knows how many changes it will go through?) but right from the start, I pined for long, cold, and dark tunnels occupied by dense, rickety shanty towns. I miss being afraid of the surface world, knowing that to explore it without enough mask filters was suicide and that the most terrifying thing was not getting into an encounter with mutants but seeing cracks in your gas mask’s visor. Even though my less than stellar experience can be chalked up to “it’s a beta,” I think it needs to do more to prove itself as an open world video game. There’s plenty of time to fix, tweak, and adjust things to make the game awesome but I can’t help but feel like the wind was taken out of my Metro sails a little bit.